Be the first to share your favorite memory, photo or story of Jody . This memorial page is dedicated for family, friends and future generations to celebrate the life of their loved one. Jody Smith, age 45 of Boone, died July 5, 2018 due to injuries sustained in an automobile accident near Boonville, Missouri. Funeral Services will be Friday, July 13, 2018 at 10:30 a.m., at the Schroeder-Reimers Memorial Chapel at Sixth and Marshall, with Rev. Phil Waldo officiating. Following the service, Jody will be cremated and her cremains will be buried with her husband, James, at a later date, in the Rose Hill Cemetery, west of Boone. Jody Lynn Smith, was born in Mount Ayr, Iowa on May 29, 1973, the daughter of Larry and Patsy (Scott) Smith. 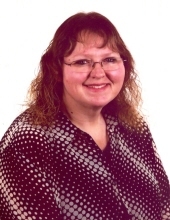 She graduated from Boone High School in 1992 and attended classes at DMACC in Boone. On June 29, 2002, Jody married James Smith-VanDeren in Boone, Iowa From 2002 to 2016, Jody was employed at CDS Global in Boone. Presently, she worked as an office assistant at the Agronomy Hall at Iowa State University. Living in Boone all her life, Jody enjoyed karaoke with her daughter, Alisyn, crafting, serving as a Girl Scout Leader, and loved serving as a ‘party planner’ for her family and friends. Jody especially enjoyed spending time with her granddaughter Lila. She was a member of the Loyal Order of Moose, Lodge chapter 209 of Boone, Fraternal Order of Eagles in Fort Dodge, Boone County Historical Society and the Boone V.F.W. Auxiliary. She is preceded in death by her grandparents, Wendell Scott and John and Beatrice Smith, a cousin, Ricky Scott. Jody is survived by a son, Adam Coy of Boone; a daughter, Alisyn Smith of Boone; her parents, Patsy and Larry Smith of Boone; a granddaughter, Lila Coy of Boone; two brothers, Richard (Marcie) Smith of Boone and Larry Smith of Clarinda; two nephews and a niece, Trevor, Briley, and Lexi Smith of Boone. Friends may call at the Schroeder-Reimers Memorial Chapel at Sixth and Marshall, on Thursday from 3 until 7 p.m. where the family will be present from 5 until 7 p.m. On Friday, friends may call at the funeral chapel from 8 a.m. until service time. To send flowers or a remembrance gift to the family of Jody Smith, please visit our Tribute Store. Visitation will take place from 8 am until the time of the service. "Email Address" would like to share the life celebration of Jody Smith. Click on the "link" to go to share a favorite memory or leave a condolence message for the family.